The Fallas festival is unique in the world and has a long history. It plays a fundamental role in Valencian culture and society, and enjoys growing popularity the world over. The festival provides an excellent opportunity for international visitors and students to get to know more about Valencia, and learning about it is key to a knowledge of Spanish traditions and festivals that pupils at schools such as Caxton College gain while studying abroad. It is an advantageous and excellent first-hand experience for them and forms a vital part of the Spanish as a Foreign Language curriculum. As mentioned in the previous post, in 1901 the Town Hall of Valencia began to award prizes recognising the artistic value of the Fallas creations, which had started out as a local neighbourhood movement. In this way the monuments began to gain importance on a political level. From that date, the Fallas festival began to grow, with more monuments, improved organisation and increased complexity. 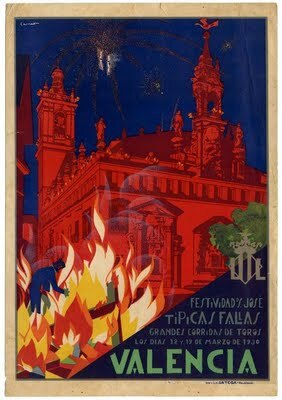 In 1929, the first promotional poster contest was held, and in 1932 the Fallas festival week was made official. 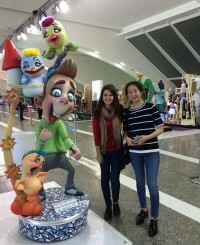 Currently, over 700 Fallas monuments are ‘planted’ just in the city of Valencia, although the festival is also celebrated in certain towns in Alicante (Denia, Pego, Calpe, Benidorm, Elda) and in Castellón (Benicarló, Almenara, Burriana, Vall d’Uxó). The Junta Central Fallera (Central Fallas Board) is the official body that regulates everything related to Fallas. The Fallas festival week is from 14 to 19 March, although the only true holiday is at the end of the week, to celebrate Saint Joseph’s feast day, since he is the patron saint of the Valencian people. From 1st March, each day at 2:00 pm in Valencia’s Town Hall Square there is a mascletà, making it clear that the city is preparing for its annual festival. The mascletà is one of the greatest attractions of the Fallas festival, but it is difficult to describe and is much better experienced directly, the closer the better, inside Town Hall Square. It is a sort of gunpowder extravaganza, consisting of powerful petards that are set off in a controlled fashion, both on the ground and in the air. The events are designed by professional pyrotechnics and last under five minutes. Their name comes from the word for a particular kind of petard that is commonly used and that is called a masclet. From the night of 14th March, the plantà begins, which is the setting up of the monuments in the streets. The littlest ones, for children, go up then. The following night, on 15th March, the big ones are set up. Each commission (group of neighbours most involved in the festival) has one of each. Prizes are then awarded in all of the different categories, depending on the budget for each monument. The themes and material used in the design of the monuments are open to interpretation, and usually agreed on between the Fallas artists (carpenters, painters and sculptors whose skills are unique in the world) and the commission. At the start of each season—after March of each year—the artists present their sketches for the following year. In summer, construction of the monuments begins, using wood, paper and other flammable materials. 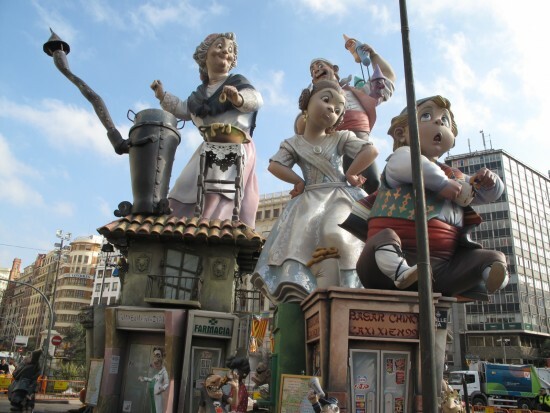 The Fallas monuments generally consist of a large central figure, taller than the rest, and different scenes around it in a circular composition meant to be displayed in squares. These scenes, and the underlying messages that the artist wishes to convey through them, are explained in a series of signs that give literary value to the monument. The texts of the signs are often satirical in nature and unify the scenes around them, even in the children’s monument, where there is a clear element of fantasy. The largest Fallas monuments in the history of the festival have been over 30 metres tall, but all of them—no matter how much they cost—are created in order to be burnt in the traditional ritual on the night of 19th March in the cremà. The only elements that are saved from the bonfires that cover the city on this night are the so-called ‘pardoned ninots,’ which are those figures that have won prizes in the Ninot Exhibition held previous to the festival. These ninots can be seen at the Fallas Museum in Valencia, located just across from the City of Arts and Sciences complex.